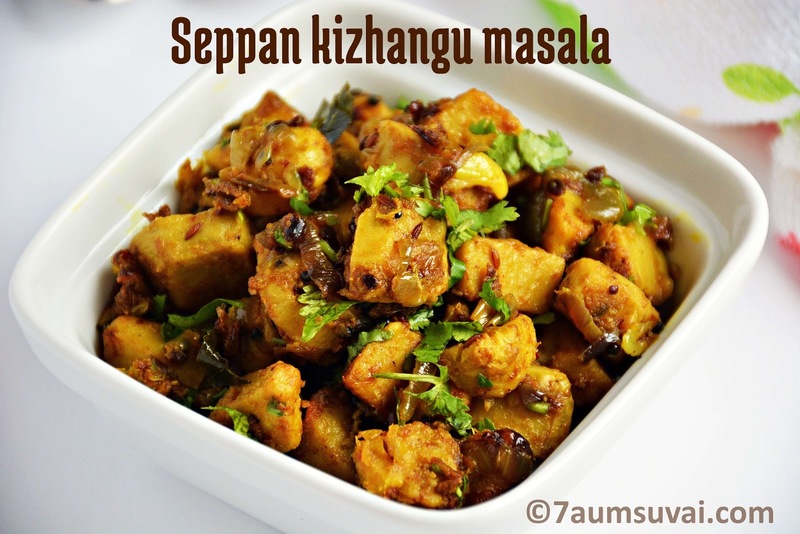 Seppan kizhangu / taro root / arbi cooked with onion and other spices over medium flame until they are well roasted. 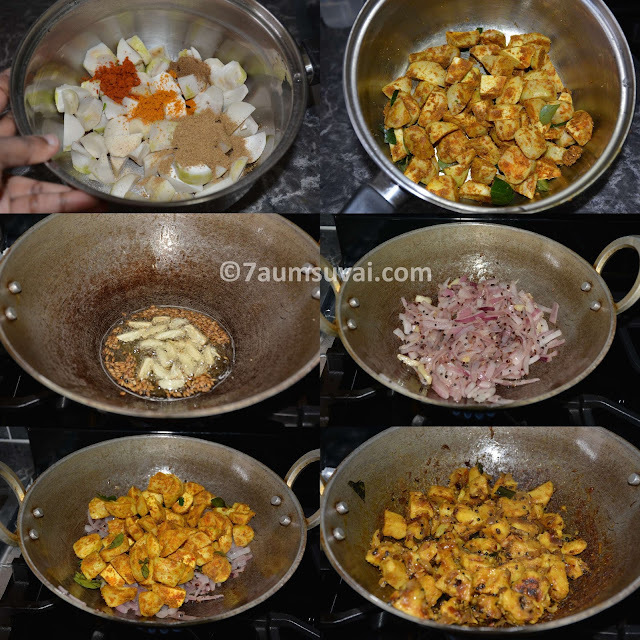 This curry goes well with mor kuzhambu and sambar. I have already posted Seppan kizhangu varuval / Taro root fry. Please click the link below for the recipe. Wash the taro and cook in a vessel filled with water, just enough to cover them fully. Bring the water to a rolling boil; cook taro until it is ¾ done or approximately 10 to 12 minutes. Once done switch off the stove, drain the water, cool and peel the skin off. Cut them into cubes and keep aside. 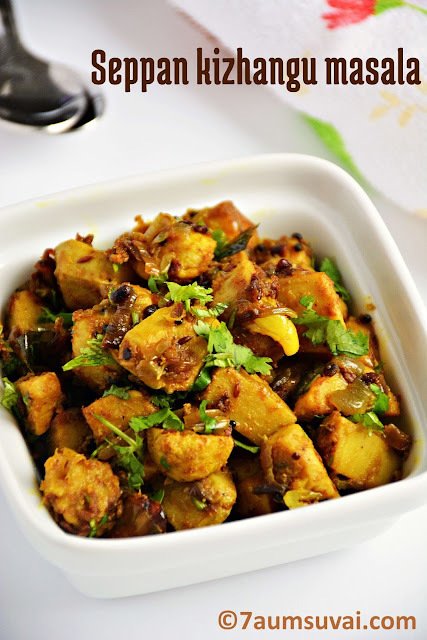 Take a mixing bowl, add Taro cubes, Kuzhambu milagai thool/red chili powder, dhania powder, garam masala, turmeric powder, curry leaves and salt, mix well thoroughly and set aside. Heat oil in a pan, season with items given in the list for seasoning. Add sliced garlic and fry until they are slightly brown in color. Followed by chopped onion, saute until they are translucent. Add marinated taro root and continue to cook over medium flame until they are well cooked and roasted. Garnish with coriander leaves.Taro root stir fry is ready. 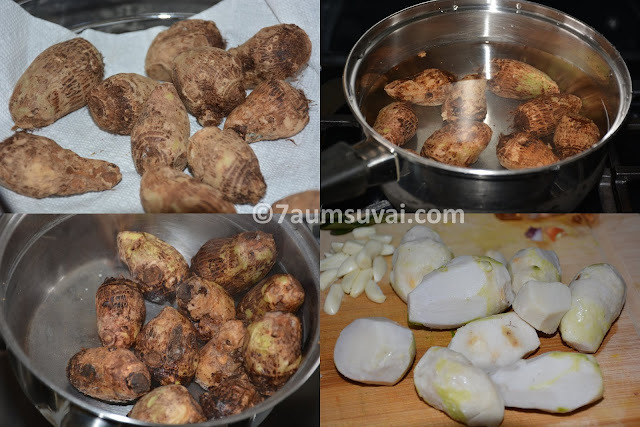 Taro root has got a tendency to turn very mushy when over cooked, so check it by inserting a knife to see if it can pass through easily. 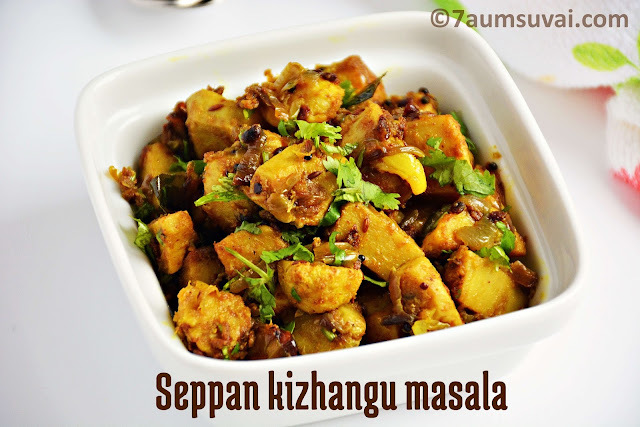 You may replace kuzhambu milagai thool with our regular sambar powder or plain red chilli power. Kuzhambu milagai thool gives awesome flavor and taste to the dish. 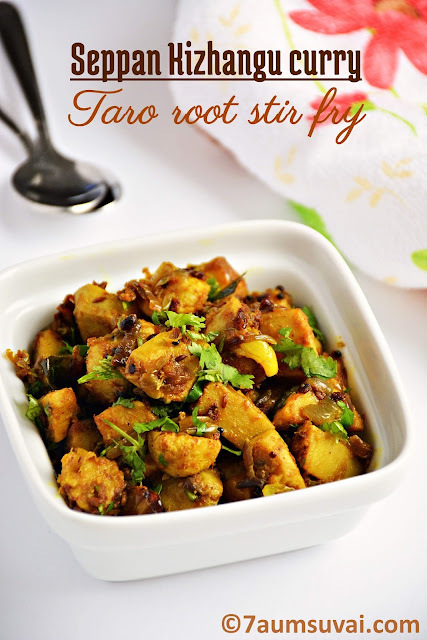 While frying taro root, drizzle some more oil if its too dry. My mooooooooooost favorite dish with Sambar rice and curd rice !